Put in to bat, Sri Lanka posted a huge total of 214 for six. In reply, Bangladesh overhauled the target with five wickets and two deliveries to spare as they recorded the fourth highest total to be chased down in T20I cricket. Bangladesh pulled off a five-wicket victory over Sri Lanka in their second match of the Nidahas Trophy Twenty20 International (T20I) cricket tri-series here at R Premadasa International Cricket Stadium on Saturday. Mushfiqur Rahim plundered 72 not out off 35 deliveries, with the help of five fours and four sixes as took Bangladesh over the rope for their first win in the tournament. Earlier, Kusal Perera (74 off 48) and opening batsman Kusal Mendis (57 off 30) starred for the hosts. They shared an 85-run partnership for the second wicket after the loss of opener Danushka Gunathilaka (26 off 19). Mendis and Gunathilaka had put 56 runs for the first wicket in 4.3 overs. 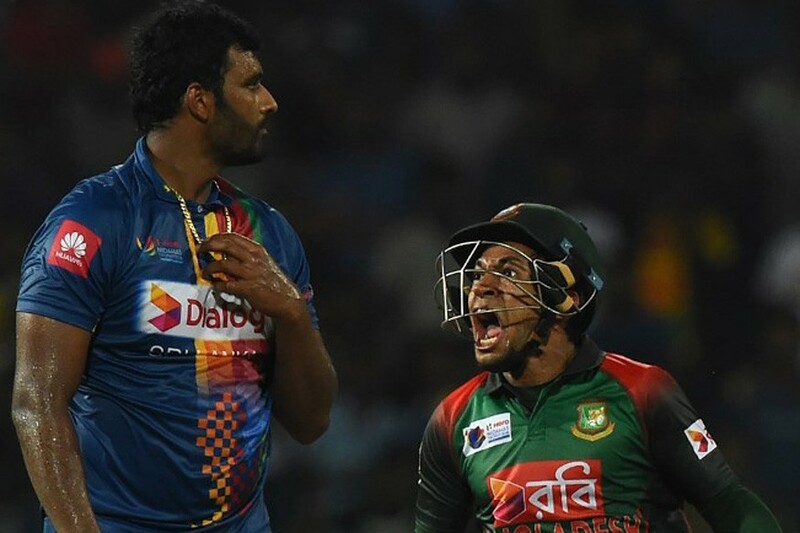 Brief scores: Sri Lanka: 214/6 (Kusal Perera 74, Kusal Mendis 57, Upul Tharanga 32 not out; Mustafizur Rahman 3/48, Mahmudullah 2/15) vs Bangladesh: 215/5 in 19.4 overs (Mushfiqur Rahim 72 not out, Tamim Iqbal 47, Liton Das 43; Nuwan Pradeep 2/37, Thisara Perera 1/36).